So just to start off I wanted to mention the obvious. You can see that I use a lot of products from The Body Shop and the reason is, well I work there. I do think that if I wasn’t working there I would still be using the same products. Here in Iceland the brand is affordable, good quality and easy to get a hold of. I payed for all of these products myself and my opinion on them is really my honest opinion. I’m not afraid to try something different but until now I haven’t found anything different in my price range that delivers the results that I want. I was quite hesitant to do this post since the products are all from the same place, but if we are going to talk makeup I feel like we have to talk skincare. Maybe you’ll try some of these products out, maybe you’ll find something similar but the important thing is that you wash your face! ok let’s start. To take off my makeup I use the Camomile cleansing oil. I use it on my entire face, including the eyes and it gets pretty much everything off. Since I mostly wear waterproof mascara I find that I sometimes have to go in with something else just to get everything of my lashes but for the most part it gets it all off. the camomile oil is really gentle and i don’t have any issues with this product. YOu could use it by it self and move on to toner but I find I have to use something else after, just to make sure it’s all off. i’ve used the clean deeper daily wash scrub from Nivea for years and haven’t found anything that works quite the same for me. I used up one of the grapefruit washes from neutrogena, but didn’t really get on with it. This one has a light scrub, foams nicely and doesn’t leave my skin dry afterwards. I feel clean after using this product. Sometimes, like every other day, I will use it with a “scrub sponge” just for a little extra scrub. 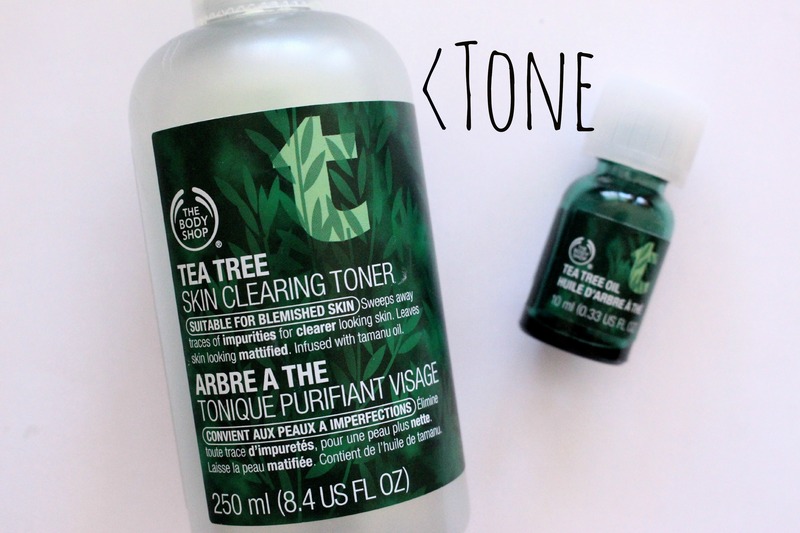 To tone I use the tea tree skin clearing toner. it’s made for blemished skin or for someone wih oily skin. I’ve never had bad acne or really oily skin (knock on wood) but THIS IS A MUST HAVE FOR ME, CAN’T LIVE WITHOUT IT. It gets the rest of my makeup off at night and is what I grab in the morning when I can’t be bothered to wash my face properly. When I’m feeling extra dry this can make me feel a little tight but i just make sure to moisturise well afterwards. To moisturise during the day I use the Aloe soothing day cream. 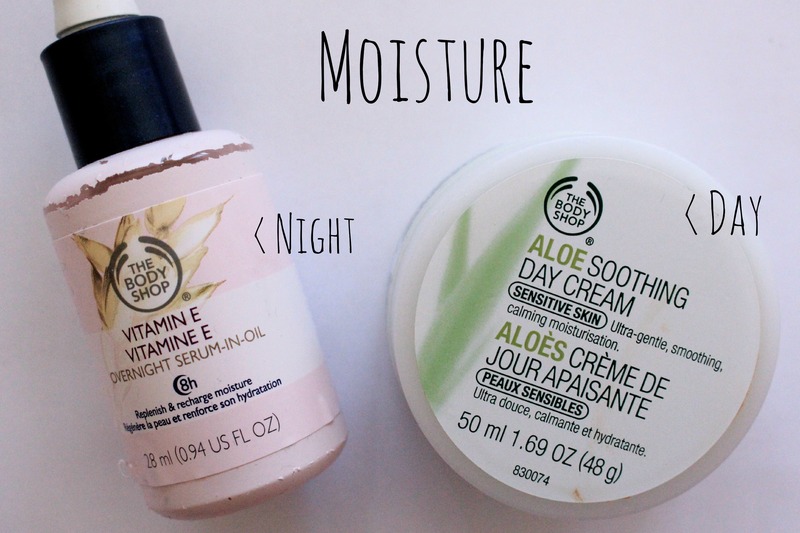 This one is for more sensitive skin types that needs moisture. there is no scent to it and has a thicker consistency but doesn’t leave a film on the skin, I can apply makeup pretty much straight after putting this on. it is a pretty standard cream but the aloe is soothing, and sort of cooling, wich i enjoy. For night time I tend to grab the Vitamin E overnight serum-in-oil. I’ve talked about this before but it pretty much is a oil that turnes into a serum once you rub it in. This is a boost of moisture that replenishes and recharges the skin overnight. I feel like my skin is more plump and alive after using this. I don’t tend to use it every night, I don’t feel like i need it that often, but i do see a huge difference after. To kill any unwanted friends on my face I use tee tree oil. Tee tree oil kills bacteria and is used for many different things. I like to apply this on any spots I might have and it helpes to dry them up without drying out the skin. I also tend to apply this every night on places I know i’m prone to breakouts (mainly my t-zone) since I feel that it prevents me from getting them aswell. You can also use this to prevent mosquito bites, lice and sanitize stuff. I love to scrub my face and probably do it more than i should.. 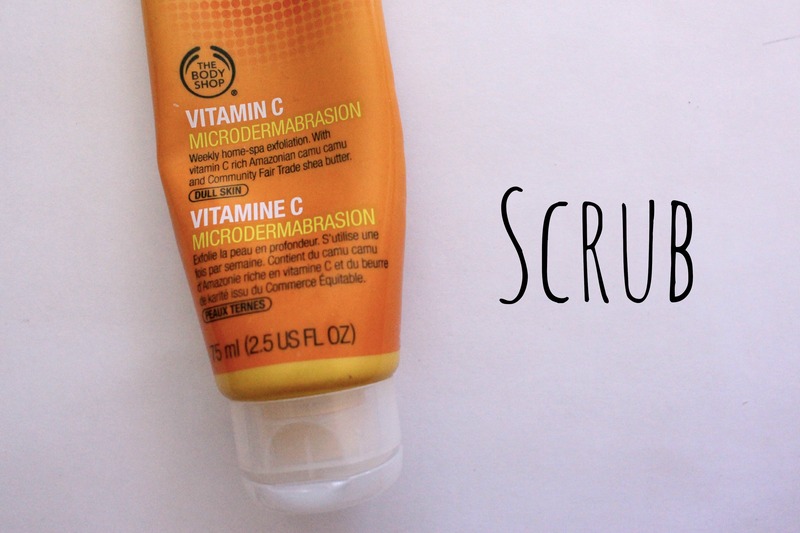 This one in particular is the vitamin c microdermabrasion and is a weekly exfoliator. the Vitamin C oil is brightening and evens out skintone. this get’s everything off. it pretty much removes a layer of your skin and makes you feel so smooth and refreshed. I like using this before an event, since it makes makeup application really easy and makes you look glowy, or applying a mask. The mask i’ve been using lately is the seaweed ionic clay mask, it purifies, cleanses and controls excess oil. I’m not really sure how i feel about this one yet, I think it could be a little too harsh for my skin. I do like the results that i get from using this but like I said I think it might be a little to harsh, i just make sure to moisturise well after. Masks are something I like to try out so if you have any suggestions for me I would love to know! Hopefully you got something from this post, if you have any suggestions for products I would love to hear them! Again I’m sorry most of these products are from the same brand but the important thing is that you cleanse your makeup off and moisturise your skin.